Are you considering a breast augmentation? In addition to technical knowledge about the procedure, it can also be particularly clarifying to view the results of a breast augmentation with your own eyes. 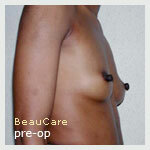 Our photos show the results after a breast augmentation.